Jurassic Park came out when I was a kid, and I remember knowing every single dinosaur name by heart, like many growing up at that time. I always wondered, too, whether a T-Rex once walked in my backyard. One thought that didn’t cross my mind then, but does now is, “What were Polish dinosaurs like?” You always hear about fossils being discovered in the southwest United States or South America, but never in Poland. Being the crazy Polish guy that I am, I immediately looked into the matter, and here is what I unearthed (pun totally intended). 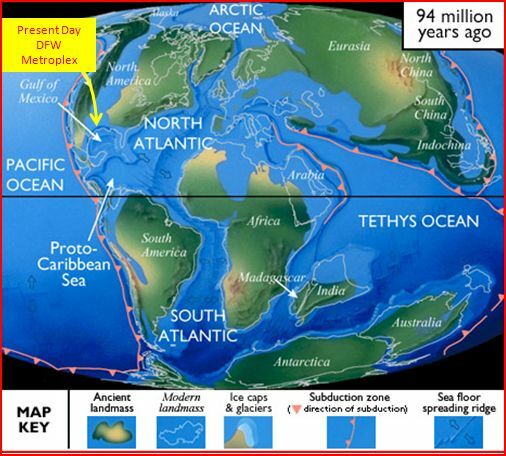 Map of the world during the Cretaceous period (145 million years ago-65 million years ago). Notice Europe is mostly covered in water. 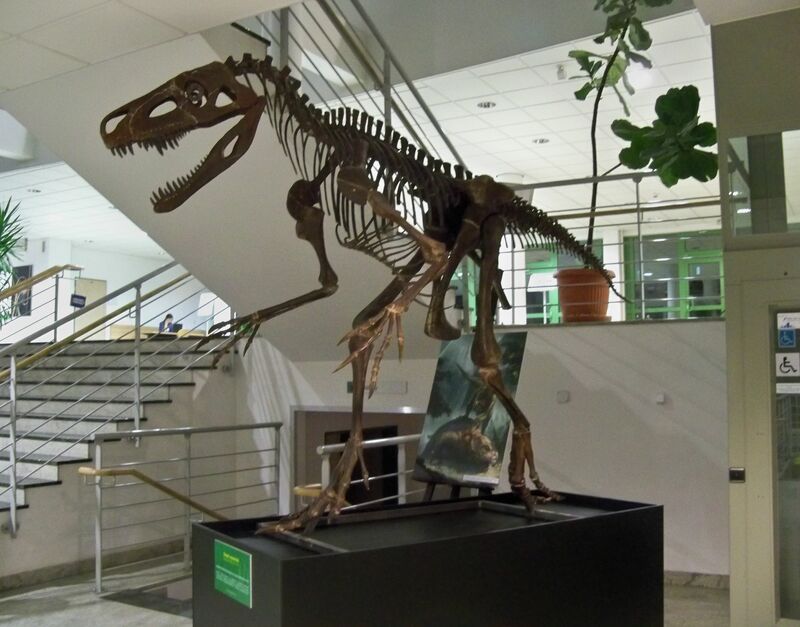 Not many dinosaur fossils are found in Poland, and there’s a very good reason for that. 65 million years ago and earlier, the earth’s continents looked completely different because the tectonic plates had not yet shifted to their present locations. If you look at the map on the right, you will notice that most of Europe was literally under water back then, including much of Poland. That kind of makes it hard for land animals, doesn’t it? There were, however, some exposed areas, especially in the earlier periods like the Triassic and Jurassic, where dinosaurs and their ancestors did roam, and a number of famous specimens have been discovered. Several years ago, paleontologists uncovered the oldest evidence of dinosaurs’ ancestors in the Holy Cross Mountains of central Poland. Footprints of a cat-sized creature that walked on four legs and lived 250 million years ago were discovered in a Polish quarry. These small animals, called Prorotodactylus isp., technically predated the dinosaurs, living in between the Permian and Triassic periods. Anatomically speaking, however, scientists do classify them as dinosaurs since they walked with their feet close together and had three large toes in the center of their feet and two smaller ones out to the side. Nearby, newer tracks of what is believed to be the first dinosaur to walk on two legs were also found. This animal, called Sphingopus, is estimated to have lived 246 million years ago and was larger than Prorotodactylus isp., its tracks measuring .5 feet (15 centimeters) long. Near Opole, in Poland’s Silesia region, many remains have been found of animals from the late Triassic period (230 million years ago). 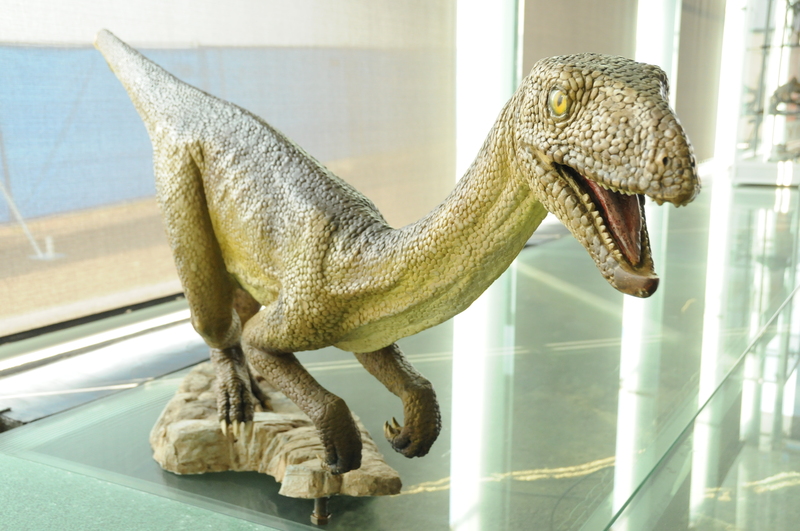 Named Silesaurus, these creatures were small, measuring 1.6 feet (.5 meters) tall and 6.5 feet (2 meters) wide. Like Sphingopus and Prorotodactylus isp, these were pre-dinosaurs, but were anatomically similar to their larger descendents. Silesaurus walked on all fours, but is believed to have been capable of walking on two feet as well. It was a light and quick dinosaur, especially when young, a trait that helped it escape predators. Experts believe it was either a herbivore or an omnivore. Although the Silesaurus looks like a predator, it actually most likely ate plants. This is one of the dinosaurs you will see in a Polish museum. Skeletal reconstructions and models of the Silesaurus can be found in the Museum of Evolution in Warsaw and the Jurapark in Krasiejow. You know that this is a Polish dinosaur because Poland is in its name! Polonosuchus was a four-legged predator that lived during the late Triassic period. It could grow up to 20 feet (6 meters) long and had a very tough hide for defense. The creature could attack larger prey by standing up on its back legs. Overall, it looked kind of like a large crocodile. Polonosuchus continues to be studied, and not a ton of additional information is currently available unfortunately. The Polonosuchus could get up to 20 feet long. One of Poland’s most famous legends is that of the Wawel dragon, who supposedly terrorized Krakow centuries ago until being outsmarted and killed by a peasant. This is only a story, of course, but in 2008, remains of a large creature were found in Lisowice, a town in southern Poland. Paleontologists estimate that the animal lived 200 million years ago and was related to none other than the Tyrannosaurus Rex, who evolved later. Called an Archosaur, this large predator measured 16 to 19 feet (4-5 meters) long, had a skull measuring two feet (60 cm) and weighed nearly a ton. Its size makes it the largest predator to roam Europe, and perhaps the world, during the Late Triassic and early Jurassic periods. In many ways, it was actually a cross between a crocodile and a T-Rex. Click here to read a scientific paper with more details about this fascinating dinosaur. This could be the skeleton of the famous Wawel Dragon. This Archosaur certainly represents one of Poland’s proudest paleontological finds. When it was discovered in southern Poland, it was immediately nicknamed Smok Wawelski, or Wawel dragon. It is not unreasonable to believe that the famous legend itself may stem from this giant predator. Centuries ago, if a Pole accidentally dug up the skeleton of one of these animals, he or she would have had no idea about dinosaurs. The automatic reaction would have been to call it a dragon, or some other mythological creature. In that sense, when we look at the skull of the Archosaur, we may be staring into the very face of the Wawel dragon. Overall, Poland continues to provide evidence of some of the oldest creatures to walk the earth, making it a unique spot on the planet for studying how dinosaurs evolved. In that sense, you could say that Poland is where dinosaurs began. Well, these are real fake news! The animals on the photos are all Triassic ones, and none of them Jurassic. Polonosuchus IS NOT a dinosaur, not even close! Silesaurus and Smok might be dinosaurs, but that’s uncertain. Prorotodactylus and Sphingopus are not names of animals but of ichnotaxa. It is highly unlikely that the legend of the Smok actually stems from the finds of archosaur Smok. The proper writing of scientific names is: archosaur, Tyrannosaurus rex, and Smok wawelski. The title is meant to be a play on words of Jurassic Park–not describing the epoch of these animals. It’s supposed to be a fun article, not “news.” This is a Polish blog, not a scientific journal. And I have my sources. Please cite yours.